President Muhammadu Buhari on Friday accepted the resignation of Finance Minister, Kemi Adeosun. The President in a tweet thanked the minister for her services to the nation while wishing her well in future pursuit. Buhari asked the Minister of State for Budget and National Planning, Mrs Zainab Ahmed, to oversee the Ministry of Finance with immediate effect. 1. Zainab Shamsuna Ahmed was born 55 years ago in Kaduna State. 2. She obtained a Bachelors Degree in Accounting from the Ahmadu Bello University, Zaria in 1981 and an MBA from the Ogun state University, Ago Iwoye. 4. In 1995, where she worked in various departments and rose to the rank of the Deputy General Manager (DGM). 5. In 2010, she was appointed to serve as the executive secretary of the Nigeria Extractive Industries Transparency Initiative. 6. 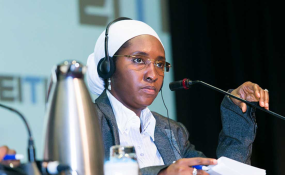 She was appointed Managing Director of Kaduna Investment Company. She was then appointed a member of the National Stakeholders Working Group (NSWG). 7. She is a fellow of the Association of National Accountants of Nigeria (ANAN), a member of the Nigerian Institute of Taxation and the Nigerian Institute of Management. 8. She is the Minister of State Budget and National Planning.